Beginning in 2012, bats used in high school baseball will be required to meet the Batted Ball Coefficient of Restitution (BBCOR) guidelines limiting the capacity of a bat to transfer force (velocity) to the batted ball (exit speed ratio)(BSR). For a list of BBCOR- and BSR-compliant bats approved by NFHS (as of March 10, 2011), click here. For Little League Baseball, the maximum bat length is 33 inches and maximum barrel diameter may not exceed 2 1/4 inches. Since 2009, all Little League bats must be labeled with a bat performance factor (BPF)(a measure of a non-wood bat's performance relative to wood bats) of 1.15 or lower. Beginning in 2011, Little League imposed a moratorium on the use of composite bats for all baseball divisions, citing research finding that, "while they meet the standard when new, can exceed the standard after a break-in process." For the Little League Major Baseball Division and below: The moratorium on composite-barreled baseball bats remains in effect. However, some composite-barreled baseball bats that have been proven in laboratory testing to meet the BPF standard throughout the life of the bat, through the Accelerated Break-In (ABI) process, have received waivers. For Little League's list of Licensed/Approved Composite 2 1/4 Bats for 2012, click here. 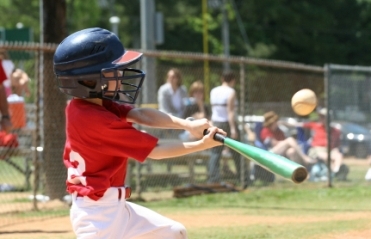 In the Little League Majors Baseball Division and below, there is no limit on the "drop" weight of any bat. For Junior League Baseball: Little League's rule has been updated to reflect the changes that were anticipated and published in 2010 regarding bats with 2 5/8 inch barrels. As a result, composite-barreled baseball bats in this division, regardless of barrel size, must meet BBCOR standards, and must be so labeled. All composite-barreled baseball bats that meet the BBCOR standard have a "drop" of no more than "minus-3." However, in the Junior League Baseball division, bats that do not have composite materials in the barrel (i.e., all metal, all alloy, all wood), and meet all other applicable standards, can have ANY drop weight. Bats with a barrel of less than 2 5/8 inches also can be used in the Junior League Baseball Division, but must still comply with all other specifications noted. For Senior League Baseball and Big League Baseball: The rule has been updated to reflect the changes that were anticipated and published in 2010 regarding bats with 2 5/8 inch barrels. As a result, all bats with non-wood barrels must meet BBCOR (Batted Ball Co-Efficient of Restitution) standards, and must be so labeled. Because all BBCOR bats have a "drop" of no more than "minus-3," this means all non-wood bats in these divisions must have a drop of no more than minus-3. Definition of an Illegal Bat: To narrow the definition of an illegal bat, a new entry was added to Rule 2.00, specifically describing an illegal bat for the purposes of imposing the penalty. has material on the grip (or no material) that does not meet the specifications. Softball: All rules regarding bats in all softball divisions remain the same as in 2011. The moratorium on composite-barreled bats does not apply to softball. A list of approved and licensed composite bats can be found on the Little League website. Junior League: it shall not be more than 34 inches in length; nor more than 2 5/8 inches in diameter, and if wood, not less than fifteen-sixteenths (15/16) inches in diameter (7/8 inch for bats less than 30") at its smallest part. All composite bats shall meet the Batted Ball Coefficient of Restitution (BBCOR) performance standard, and such bats shall be so labeled with a silkscreen or other permanent certification mark. The certification mark shall be rectangular, a minimum of a half-inch on each side and located on the barrel of the bat in any contrasting color. Senior/Big League: it shall not be more than 36 inches in length, nor more than 2 5/8 inches in diameter, and if wood, not less than fifteen-sixteenths (15/16) inches in diameter (7/8 inch for bats less than 30") at its smallest part. The bat shall not weigh, numerically, more than three ounces less than the length of the bat (e.g., a 33-inch-long bat cannot weigh less than 30 ounces). All bats not made of a single piece of wood shall meet the Batted Ball Coefficient of Restitution (BBCOR) performance standard, and such bats shall be so labeled with a silkscreen or other permanent certification mark. The certification mark shall be rectangular, a minimum of a half-inch on each side and located on the barrel of the bat in any contrasting color. Aluminum and composite bats shall be marked as to their material makeup being aluminum or composite. This marking shall be silkscreen or other permanent certification mark, a minimum of one-half-inch on each side and located on the barrel of the bat in any contrasting color. NOTE 5: An illegal bat must be removed. Any bat that has been altered shall be removed from play. Penalty - See Rule - 6.06 (d). Illegal Bat - An Illegal bat is a bat that has been altered or a bat that is not approved for play because it does not meet specifications with regard to length, weight, barrel diameter, labeling or performance standard for the division in which it is used. (d) The batter enters the batter's box with an illegal bat (see bat specifications Rule 1.10) or is discovered having used an illegal bat.